Nintendo Labo is a rather novel idea that is made possible thanks to the technology found inside the Joy-Con controllers. 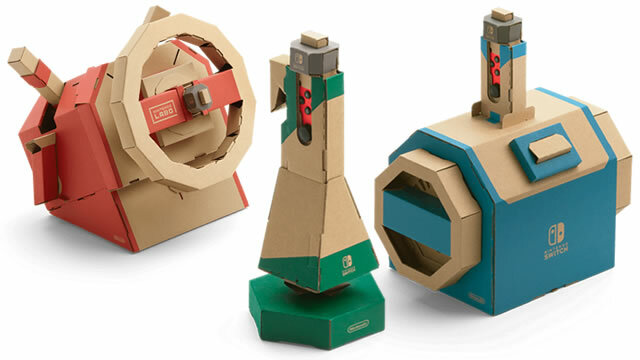 Honestly, who would have thought of creating Nintendo Switch accessories made of cardboard that can be used for real? The concept has proven successful and Nintendo has just announced the Labo Vehicle Kit and it’s coming on September 14. The Labo Vehicle kit features five different Toy-Con projects including a car steering wheel, pedal, plane flight stick, key and submarine controller. Once assembled, players can control a car, plane and submarine in the included game that dishes up some racing, battling and exploration action. As part of the announcement, Nintendo also released a video to showcase the Labo Vehicle Kit in action. Nintendo sure makes it look easy to assemble the various projects as a young boy appears to be up and running in no time. Don’t be fooled though. These various Vehicle Kit projects will take some time to assemble if you consider Nintendo approximate build times from previous Labo releases. Assembly is part of the fun right? There is a lot of bouncing around in the announcement video, but you can see just how much functionality is built into these cardboard accessories. It’s quite remarkable actually. You have a gas pedal for your foot, a steering wheel with a pull string and levers to shoot and power boost, a key that is used to seamlessly switch between various vehicles on-the-fly during the game, a submarine controller to rotate propellers and plane flight stick to control a plane or car turret. A friend can join in on the action as well. According to a tweet from Nintendo, you can “explore a world full of challenges solo or with a friend” so prepare yourself for some unique co-op action done up Labo style. This co-op gameplay feature is demonstrated In the announcement video, where they show a father shooting a turret on the car via the plane flight stick while the son does the driving. The Nintendo Labo Vehicle kit will be available on September 14 for $69. Nintendo has been busy with Nintendo Labo over the past number of months and released the Variety Kit and Robot Kit. and last June, Nintendo rolled out an update to Mario Kart 8 Deluxe that allowed players to use the motorbike Toy-Con.